Today is the first anniversary of the shocking murder of MP Jo Cox in her constituency of Batley and Spen. I remember that day – those days – in the summer of 2016 so vividly. My mum had died just over a week earlier and we were hurtling towards the EU Referendum Vote. I remember looking for silver-linings in my grief, and I found myself almost grateful that mum had been spared knowing about Jo Cox’s murder. And, after mum’s funeral, I reflected that she had also been spared seeing a nation so divided among itself following the EU Referendum result. This weekend there will be Great Get Togethers all over the country in honour of Jo Cox’s memory, as part of the More in Common movement her death has birthed. There’s no doubt that Jo’s death was a part of the impetus behind our choosing The Common Good as our festival theme for this year’s Greenbelt. It’s a theme which seems to have become more and more prescient over the weeks and months that have followed. And so we are delighted and honoured that Jo Cox’s sister Kim Leadbeater will be coming to the festival this August to share – alongside Batley and Spen community activist Fakhara Rehman and local parish priest Mark Umpleby – about working in the days following Jo’s shocking murder to found the More in Common local group, which has since grown into a national movement. Whenever terror, in any form, hits, the ways in which a community responds in crisis speaks volumes of our shared and common humanity. At a time of huge political and financial uncertainty, when our safety and our society seems under threat in so many different ways, Greenbelt is a space where we can gather to hold one another, to welcome new festivalgoers in, to pause, to take stock, to laugh – and cry, to find inspiration and courage to continue to live creatively, generously and justly – for The Common Good. Above all, as we witness the wonderful array of artists and activists on the bill this year at the festival, we will be reminded that Greenbelt has always been a space in which the voiceless are given speaking parts and the marginalised are brought centre stage. That’s what artistry and activism at their best so often do – shining a spotlight on truths in a way our everyday discourse so rarely does. More than I can ever remember, it feels as though we are at a watershed moment, a tipping point. We need our artists and activists, our thinkers and dreamers. There is a growing sense that things cannot continue as they have done for decades now – from banking and finance, to politics, housing, religious institutions. It’s time for change. Sea change. We have a wise sage with us at Greenbelt this year in Charles Handy. His latest work is all about The Second Curve – the idea that, as old ideas and systems die, the trick is to jump off them onto new curves and trajectories that are barely discoverable, let alone tried and tested. His argument is that we face this need to jump on every front today if we are to truly live. At the age of 90, his challenge is prophetic and powerful. 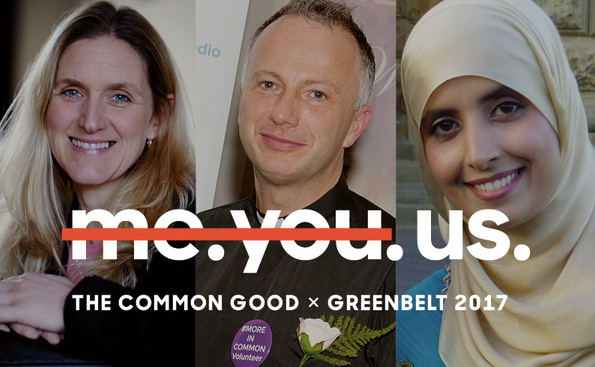 So, as we remember Jo Cox and live in the light of her More in Common legacy this weekend at The Great Get Together, we gather at Greenbelt later this summer to learn how to face a future none of us can see, but all of us must learn to sense – together, for The Common Good. Pictured: Jo Cox’s sister Kim Leadbetter with the Rev. Mark Umpleby and Fakhara Rehman from the Batley and Spen ‘More in Common’ group – who will all join us at Greenbelt this summer.